HI 5 CLAIMS 70% REDEMPTION RATE: At the recycling and redemption site at the corner of 21st and Waialae avenues yesterday, Kreston Opunui hoisted bags of collected cans and bottles onto a truck to be taken away. A 10-year study of women finds no significant benefits to prevent disease. 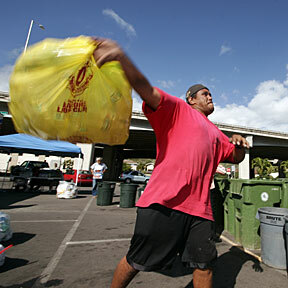 Hawaii sees a rise in recycling. Chocolate fountains have been down-sized, to offer a rich and indulgent experience right at home. Ironically, the receiver thinks Jackson's push-off was a penalty and the DB thinks it was OK.
A local visitor-publication company is selling a calendar that will benefit environmental groups. A woman and her daughter facing eviction from public housing are receiving help from a private company.